Seeing Berlin by bus is a great way to travel far and wide around the city whilst being able to hop on and off at various stops along the way to take a better look if something catches your eye. Tailor your tour to what you want to see more of. 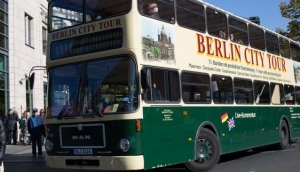 Local experts run tours in with live and recorded commentary in English all year round on various sightseeing bus tours, double-decker busses, open top in the warmer months and closed top in the winter. You can cover a lot of ground and can take as long as you like and even travel all the way to Potsdam.